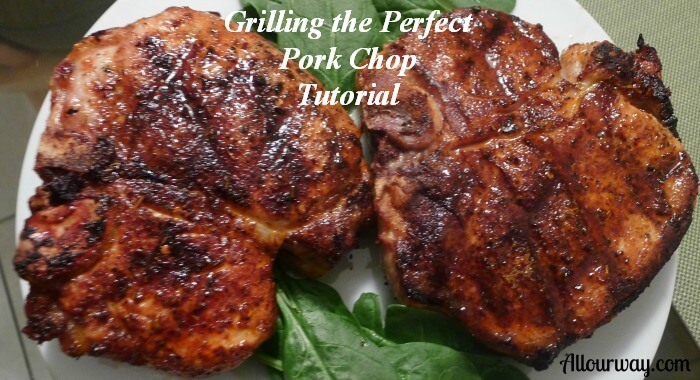 Me: I am so excited about giving a tutorial on making the best pork chops. . . ever. I have never grilled before so I am a little nervous, but I went to an expert for advice, and he has graciously accepted the invitation to show me the way. The Grill Master will take us step by step, so we don’t miss out on anything important. He assured me that technique is crucial. Ah, here he is. Hello, Mr. Grill Master. Mr. Grill Master: Hello, but just call me Master. Did you do everything I requested? Me: Okay, uh, Master. I followed your instructions to the letter. I bought bone-in loin pork chops cut 1 1/2 inch thick, and I let them get to room temperature. 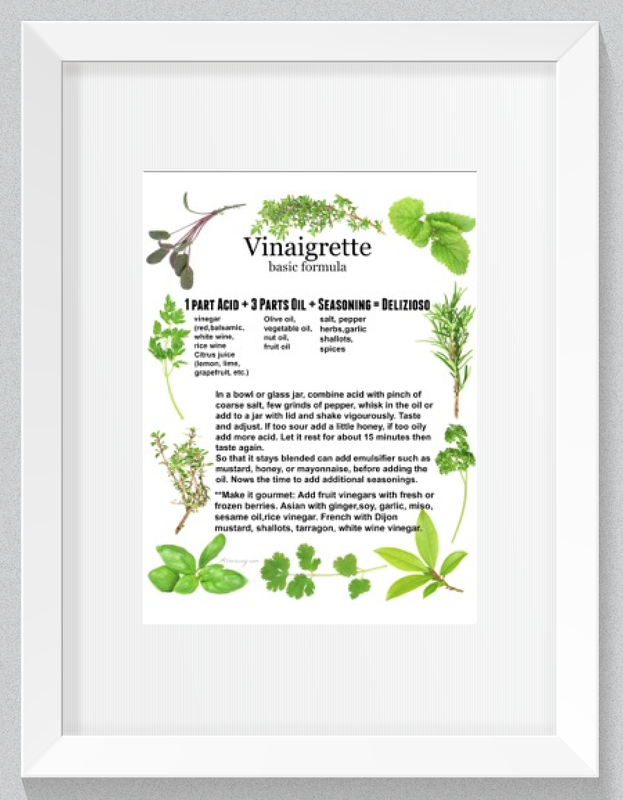 Then I sprinkled them with your special meat rub. 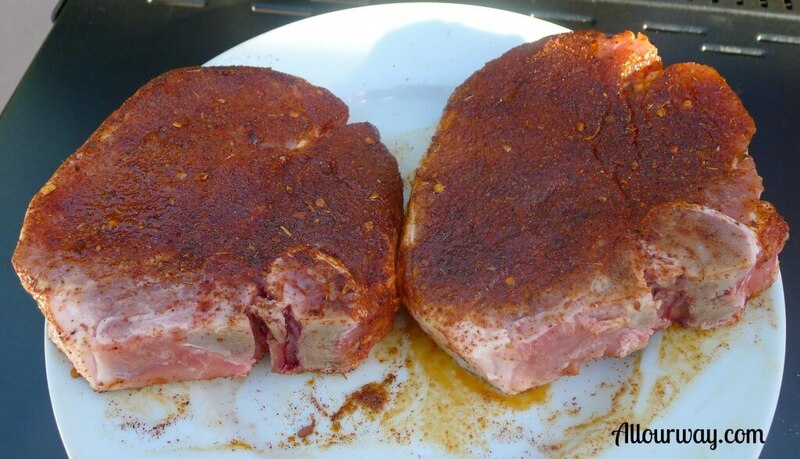 Pork Chops with meat rub. Me: Yes, and I sprayed the vegetable oil on the gas grill before I ignited it to preheat to 500F. I also preheated my indoor oven to 170F. Master: Very good, I will explain as we go along. You seem to learn quickly. Thank you, Master. I try. Master: I see you have the timer outside. And the grill lid is down so you are keeping in the heat. Do you have the clean plate and aluminum foil ready? Me: Yes. I am thrilled to have you here. My honey will be so surprised that I made him pork chops instead of asking him to do it. I believe the grill is ready. I can’t wait to put the chops on. . .
Master: Set the timer for 2 1/2 minutes. Me: Master, your frowning, what’s wrong? Master: Close the lid before you set the timer. You’re not heating the outdoors. You need to keep as much heat in the grill as possible. Me: Oops, I’ll remember that next time. Oh! The bell rang. Master: Keep the chops on the same side but turn them a quarter of a turn. Close the lid and set the timer for another 2 1/2 minutes. 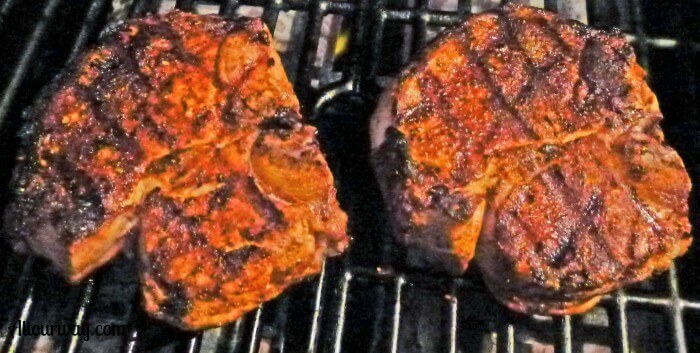 When it rings again, flip the pork chops over. You do the same thing you did on the first side. Time it for 2 1/2 minutes and then turn them a quarter of a turn. Set the timer for the final 2 1/2 minutes. Finished grilled pork chops with meat rub and grill marks. Me: Wow those look awesome! I’ve got the clean plate all ready to go. I know I’m supposed to put some barbecue sauce on the bottom of the plate put I want to get a good picture of the chops on the plate before I sauce them. Master: Pour a little of your favorite barbecue sauce on the bottom of the plate. Put the chops on top of the sauce and put some more sauce on top of them. Tent them with the foil – don’t seal them and then you set them in your preheated 170F oven for 20 minutes. Me: Okay! Since I have to wait, I guess I’ll pour myself something to drink. May I get you something? What! You’re frowning at me. What did I do now? 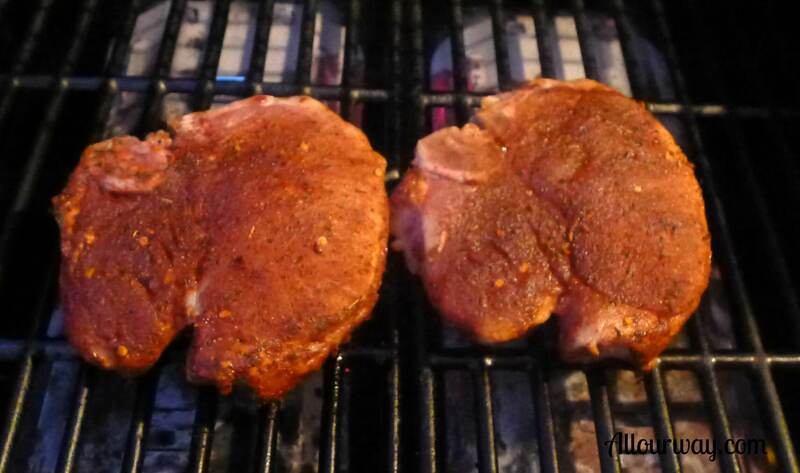 Master: Anyone who is serious about grilling knows that you have to scrape the grill and get it clean. When it’s hot is the best time. Never let your equipment get dirty. Me: I’ll remember, Master. Will you come back and tutor me some more? Master: I could be persuaded. . . It certainly was! The Master made the grilling very easy.